Our Dynamic Range measurement system involves shooting a calibrated Stouffer Step Wedge (13 stops total range) which is backlit using a daylight balanced lamp (98 CRI). A single shot of this produces a gray scale wedge from the camera's clipped white point down to black (example below). Each step of the scale is equivalent to 1/3 EV (a third of a stop), we select one step as 'middle gray' (defined as 50% luminance) and measure outwards to define the dynamic range. Hence there are 'two sides' to our results, the amount of shadow range (below middle gray) and the amount of highlight range (above middle gray). To most people highlight range is the first thing they think about when talking about dynamic range, that is the amount of highlight detail above middle gray the camera can capture before it clips to white. Shadow range is more complicated; in our test the line on the graph stops as soon as the luminance value drops below our defined 'black point' (about 2% luminance) or the signal-to-noise ratio drops below a predefined value (where shadow detail would be swamped by noise), whichever comes first. Note: this page features our interactive dynamic range comparison widget. The wedges below the graph are created by our measurement system from the values read from the step wedge, the red lines indicate approximate shadow and highlight range (the dotted line indicating middle gray). Below we take a look at how the DMC-GX7's dynamic range compares to that of two mirrorless cameras (the Sony NEX-6 and Panasonic's GH3) as well as a DSLR (Nikon D7100) - feel free to switch cameras if you like. All dynamic range-enhancing features are turned off. The GX7 has a fairly 'traditional' tone curve, with relatively uniform response. Its shape is very similar to that of the Nikon D7100 with all dr expansion turned off. 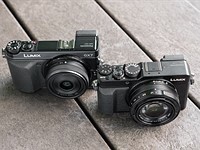 Interestingly, the GX7 is capturing an extra 1/3EV of highlight information than the GH3, allowing a smoother transition as bright areas begin to 'clip' to white - which should mean better-looking images. 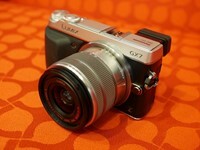 The GX7 uses the same i.Dynamic feature as other recent Panasonic mirrorless cameras. The promise of the feature is to brighten shadows and reduce clipped highlights. 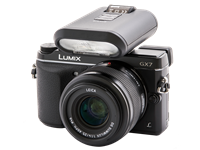 Unlike older Panasonic models, the iDynamic feature will now happily adjust the camera's exposure to capture an extra 1/3EV or so of highlight information. In addition to this, it applies a different - increasingly low-contrast - tone curve at each setting, to try to pull more tonal information into the output images. When you turn on ISO expansion on the GX7, a new ISO 125 option appears. Here's how it compares with the base ISO of 200. As you can see, the only difference in the tone curve is that ISO 125 clips highlights a lot sooner than at the default sensitivity (since it's almost certainly the sensor's base sensitivity being exposed to more light). Thus, the only real benefit to using this sensitivity is to use slower shutter speeds for studio work or trying to express motion.